And some days you see HUMPBACK WHALES! Two days ago we were sailing back across the Strait of Georgia, and it was that kind of perfect day where you don’t know what else to say except things like, “Hot damn, is this the perfect day, or what? 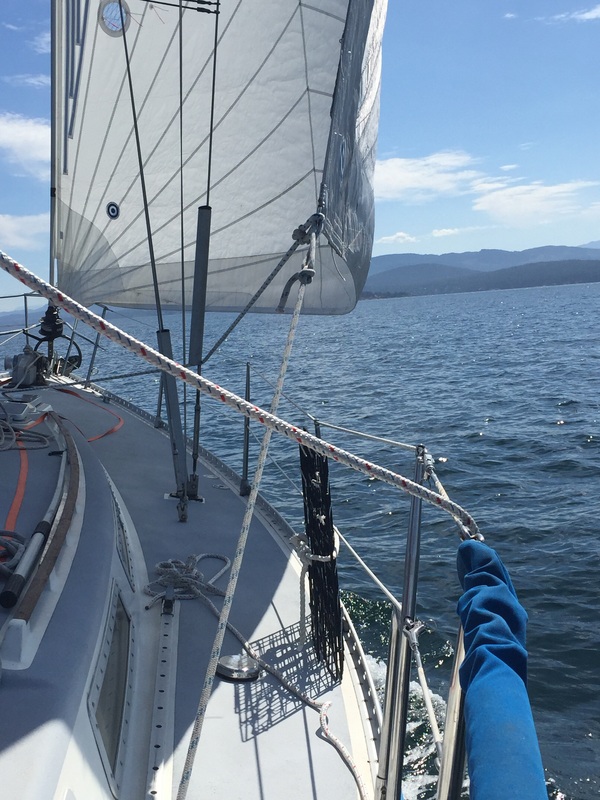 !” And, “It doesn’t get much better than this.” I felt like my grandpa with these banal but benign nice-isms, and I didn’t care because the sun was out, the sky was blue, the wind was perfect, and we sailed for miles on one tack (which means no turning). It looked like this. We were en route from Lund to Namaimo via an amazingly beautiful island named Lasquetti. We loved that island so much in fact, that we had to stop and get real. Find a spot to stop and stay for eight years, or push on. This island is amazing, people. There’s a lot of beauty up here, but this, It’s like Portugal and Aspen had a baby and named it Lasquetti Island. You want it to be the Lasquetti Triangle so you have an excuse to disappear there. Anyway, we frittered around and soaked it up like sun, but we opted to push on. Nanaimo or bust. We had to detour the roundabout way because the torpedo range was in operation (this is real). And then I saw something big lift out of the water about 20 feet off the bow of the boat. This was not like a, Oh, did you see that fish jump? Or, look! Porpoises! So cute. Or, Hi, Mr. Sea lion. No, no, no. This was like, WTF WAS THAT?! And then two seconds later, two big spouts of water off the left side of the bow. WHALES, I shouted!!!! Whales! I looked at Loren and he looked like me. Shaking and speechless and crazy with joy. And that was the beginning of our next hour. No other boats even took notice. It was just us and a few humpback whales for the next hour or so. We shadowed them quietly and watched them dive down and come up to breathe, and dive again, and a few times they flashed us their giant tails on the way back down. Each time they dove, they stayed down a little longer than the time before, but they kept surfacing nearby, and we kept finding them. Finally, though, after they’d crossed back into the bay they came out of and headed back up north, they were gone from our sight. Our hearts still pounding after all the time that had passed when it was just us and them, we watched the water and held on to one another the way you do when grace happens. I am speechless. My heart, too, is pounding with excitement!! Please tell me that you took pictures of this beautiful event!!! We did! They’re on the camera, though, so I have to download and transfer, which is hard out here. But I will post them as soon as I can! There were two juvenile humpbacks off west Seattle yesterday! Hooray for whales.